Geno Smith, meanwhile, is headed to the New York Jets. Notre Dame's star linebacker Manti Te'o — who became better known for his hoax girlfriend — was drafted sixth in the second round of the NFL draft. He's heading to the San Diego Chargers. Manti Te'o and Geno Smith provided the sizzle previously missing from the NFL draft. Te'o is headed to San Diego, Smith is a Jet, and Radio City Music Hall shook with the kind of noise usually heard in stadiums when they were selected. The theater rocked with two picks within minutes of each other Friday night. Te'o, the Notre Dame All-America linebacker, was chosen sixth in the second round by the Chargers, drawing a loud roar from the fans. One spot later, the Jets took the West Virginia quarterback, drawing a raucous reaction of cheers and boos. The big names had taken over from the bulk and beef of opening night, when 18 linemen went in the first round. Te'o, who led the Fighting Irish to the national championship game, was projected as a first-rounder last year. But his poor performance in a rout at the hands of Alabama, some slow 40-yard dash times, and a tabloid-ready hoax involving a fake girlfriend that became a national soap opera dropped his stock. "I did expect to go in the first round," Te'o said. "But things happened and all it did was give me more motivation." When former Chargers defensive back Jim Hill was handed the card to make the announcement by Commissioner Roger Goodell, he was told, "You're going to get a big cheer when you announce this pick." It was more a mix of surprise and recognition of the most talked-about player in the draft finally finding a landing spot at No. 38 overall. The Chargers traded up with Arizona to grab Te'o, the Heisman Trophy runner-up. Te'o ran a 4.82-second 40-yard dash at the NFL combine, slow for a linebacker. He did better at Notre Dame's pro day, but NFL teams already had plenty of football reasons to doubt his worthiness as a first-round pick. San Diego was willing to gamble on him. "We did a lot of work on Te'o and I've seen him for a number of years," first-year general manager Tom Telesco said. "He loves football. He's passionate about it. He loves to practice. He loves to play." Te'o was the third linebacker chosen in this draft. "It's a perfect scenario. 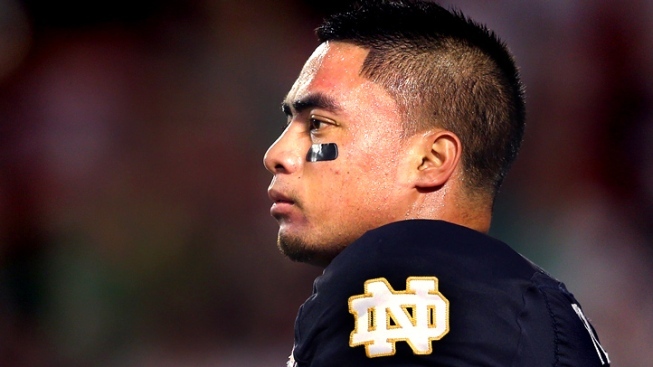 My parents can come and watch, I can go home, it's San Diego," said Te'o, a native of Hawaii. "We're all excited. I can't be any happier." With the very next pick, the Jets sent their QB situation spiraling into further chaos. They already have Mark Sanchez, who struggled last season but was brought back in great part because of a prohibitive contract. They still have Tim Tebow, who almost certainly soon will be cut. They signed David Garrard, who hasn't played in the NFL since 2010. And now there is Smith, who waited futilely throughout the first round, returned to the theater Friday and was rewarded. "It's extremely relieving. I withstood the test of time," he said. "It felt like forever in there." If Smith thought that was tough, wait until he enters the cauldron overseen by Jets coach Rex Ryan, where every move by every QB on the roster is tabloid-Internet fodder for days. "I'm a competitor and I'm going to accept my role on the team, whatever is handed to me," Smith said, "but my job is to compete day in and day out." Safety Johnathan Cyprien of Florida International was the first selection of the second round. Cyprien was a standout in the Sun Belt Conference and really solidified his stock with an excellent performance in the Senior Bowl. "He's got a passion for the game," coach Gus Bradley said. "He is very animated. He just enjoys it. He loves to play the game. I think he's going to add to what we have here and the attitude that we're looking for." Arizona added some spice to the third round by selecting former LSU cornerback-kick returner Tyrann Mathieu. The Honey Badger was a 2011 Heisman Trophy finalist that LSU dismissed from the team last August for failing a drug test. He was arrested in late October after police said they found marijuana at Mathieu's apartment. "He impressed me so much in my office one on one, knowing at this point in time what he needs to do in his life," Cardinals first-year coach Bruce Arians said. "I was really taken aback a little bit. He knows what his problems are, he knows what he has done to himself, but he also knows that someone will give him a chance, that he knows what he needs to make sure he succeeds." Other notable second-round picks Friday were Tennessee wide receiver Justin Hunter by the Titans, who traded up with San Francisco; Stanford All-America tight end Zach Ertz by Philadelphia; and North Carolina's Gio Bernard, the first running back chosen, by Cincinnati. After no running backs were selected in the first round, five were taken in the second. The number of linemen dropped to five. The presumed top-rated running back, Eddie Lacy of Alabama, went with the next-to-last selection of the round, to Green Bay. NCAA record-setting RB Montee Ball of Wisconsin was chosen by Denver. Tampa Bay's first pick this year was defensive back Johnthan Banks of Mississippi State at No. 43 overall. Washington, which traded it first-rounder last year to draft Robert Griffin III, went for defensive back David Amerson of North Carolina State at No. 51. New England, known for trading early picks for a bunch of later selections, chose linebacker Jamie Collins of Southern Mississippi at No. 52. Seattle, after trading down six spots with Baltimore, closed out the second round by taking running back Christine Michael of Texas A&M. Cleveland used its second-rounder, which would have been 39th overall, in last year's supplemental draft to take wide receiver Josh Gordon of Baylor, who made 50 catches for the Browns in 2012. New Orleans was stripped of its second-round pick in the bounty scandal. The final pick of Day 2 was the Titans' selection of Missouri linebacker Zaviar Gooden. Among those who didn't go were quarterbacks Matt Barkley of Southern California, Landry Jones of Oklahoma and Ryan Nassib of Syracuse; South Carolina RB Marcus Lattimore, who is recovering from a severe knee injury; and two starters from national champion Alabama, OL Barrett Jones and DT Jesse Williams.